Digital signage is making waves in a variety of industries, changing the way we attract consumers, and how we grab and retain their attention. Have you noticed how video walls and interactive kiosks are now common fixtures in retail stores, hospitals, and college campuses? Or how restaurants and cafes are increasingly opting for digital menu boards? That’s because digital signage is the world’s second fastest growing ad medium. As a marketing and advertising strategy, digital signage beats any other out-of-home media in capturing audience attention, influencing their decisions, and building a positive brand image. No wonder the use of digital signage is speeding up. Let’s take a closer look at the factors driving its adoption. 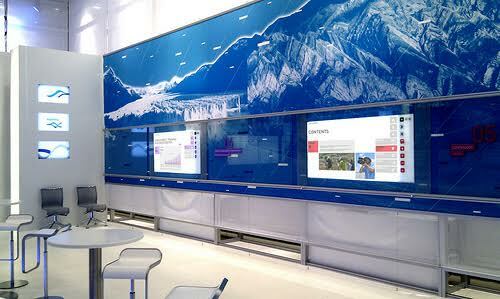 But, before we do, here’s a quick glance at the current state of the digital signage market. A recent MarketsandMarkets survey estimates a $23.76 billion growth figure for the digital signage industry by 2020. A new study by Grand View Research, Inc found similar results, predicting the global digital signage market will reach $20.03 billion by 2020. According to the report, retail and healthcare industries are the two areas primed for maximum growth over the next six years. And a recent IDC report predicted a 10 percent jump in overall market revenue for the digital signage industry this year. Clearly, with more businesses realizing the benefits of integrating digital signage in their overall marketing strategy, the signage industry has a bright future. Digital signage is being used in transportation systems, public spaces, and corporate buildings. Sectors including the aforementioned retail and healthcare, as well as education, hospitality, banking, and automotive are all toying with the various applications of digital signage for a number of reasons. First, digital signage offers unique opportunities to reach a wider audience, even while they are on the move. Second, digital signage helps brands to communicate their messages loud and clear. When strategically placed, digital signage tools can create maximum impact on a more targeted audience. Third, digital signage allows brands and marketers to get more creative with their content. In fact, it puts a whole new spin on customer interaction. A case in point is Coca-Cola’s ultra-interactive campaigns. A recent article on Digital Signage Today, listed some impressive statistics that will help you understand what is making digital signage such a lucrative investment for brands and institutions. Here are some of them. Multichannel campaign management is a top priority for more than a quarter of companies. Digital signage blends the online and offline into more seamless purchase experiences for customers. Helping brands to serve customers across multiple channels, digital signage is a great addition to a brand’s multichannel marketing strategy. Digital menus influence almost 30 percent of buyers. Digital signage helps customers navigate menu-items using attractive visuals, and are better and more interactive substitutes for traditional, static menus. Broader reach of digital signage video. Digital video manages to reach 70 percent of its targeted audience. When compared, Facebook and online video reach less than 45 percent. Brands and marketers can leverage digital signage video to get noticed by a larger audience. Digital signage cuts down waiting times at checkouts. Using digital signage can reduce the waiting times at checkout by up to 35 percent. This leads to a more positive in-store experience for customers. Beacons improve digital signage applications. Fifty percent of leading U.S. retailers, including Target, are testing beacons this year, allowing brands to send highly targeted and personalized messages, offers, and discounts directly to customer’s smartphones, and driving real-time marketing efforts when it some stop the content displayed on in-store digital signage. Beacon is a location-based technology that’s driving digital signage usage among retailers. Digital signage brings a 31.8 percent increase in overall sales volume. Digital signage applications cut down queue times, provide better information on products, their availability, price, etc., and offers better store navigation. All of these factors enhance the shopping experience of customers and ultimately lead to increased sales. Digital signage is making waves in a variety of industries. It’s changing the way we attract clients and buyers, and how we grab and retain their attention, and it’s bringing huge benefits to both retail and enterprise business. It’s clear that digital signage is a must have.